OWOSSO SPEEDWAY – May 22nd and a quick re-schedule brought the club to the Owosso Speedway for some excellent weather and fantastic racing action. 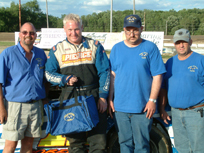 The MARFC Helmet Bag went to Pro Stock Driver Eric Olson as he was the winner of the Owosso fan poll and is a great supporter of the speedway. Table helpers were Steve and Cory Russell, Laura Tucker, and Sue Ginter. Jack Colpean Sr. was the raffle prize winner. Many Thanks to Rick and Jennie Miracle & Jeff and Pam Parrish for having the club out to Owosso and for a quick re-scheduling! DIXIE MOTOR SPEEDWAY – May 28th took the club to the Dixie Motor Speedway and another great night of racing. A special note for the night is that two MARFC Member/Drivers won their feature events that night as Matt Todd won in the Michigan Legends and Don Riley won in the Pro Stock division just as he had the week before at Owosso on MARFC night. Former 2 time street stock champion Jim Severn was selected to receive the MARFC Helmet bag but was delayed in getting to the track so the presentation was made to Jim’s car owner Matt Mosier. For the second week in a row, Jack Colpean Sr. was the raffle prize winner. 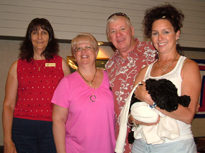 Table helpers at Dixie were Sue Ginter, Larry and Sue Iacoboni, Kenny & Larry Letts and Big Al Peltier. Once again, Thank you to Jeff & Pam Parrish for hosting the night. 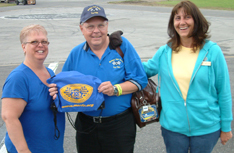 FLAT ROCK SPEEDWAY – June 5th was Flat Rock Speedway with that old biddie Mother Nature getting the better of things but not before awarding the MARFC Helmet Bag went to Second Generation Racer and Street Stock Driver, Harold Davis Jr.. The MARFC Club photographer, Paul Anton won the member raffle prize. This event will be repeated on August 28th so mark your calendars for a return to the Flat Rock Speedway. Thanks to our table helpers Larry & Sue Iacoboni, Laura Tucker, and Steve & Cory Russell as well as a great big Thank You to Ron Drager and Scott Schultz and the staff of the Flat Rock Speedway for their hospitality. CRYSTAL MOTOR SPEEDWAY – June 19th was our annual trek to the Crystal Motor Speedway. Our helmet Bag went to the #17 modified driver Brad Roberts. Brad has been up front many times this year and looked like the car to beat only to have the racing Gods steal the shine from his parade and move Brad back in the pack or end the night in the pits before the checkers would fly. Brad made the switch over to dirt a couple of years ago and puts on a great show as a driver. Our MARFC Raffle winner was Greg Sheppard while our table helpers were Larry and Kenny Letts with additional help by Doug Jakeaway. Thanks to Ron Flinn and the staff at Crystal for an outstanding time. NAARFC CONVENTION – Our 58th Annual NAARFC Report! MARFC once again had a strong counting at the National Convention this year and again lead the national with the most patron names on our patron page for 2010. Highlights included racing legend Tom Sneva being on hand to be inducted to the Hall of Fame and spent some time with the MARFC Contingent. Bobby Unser was also inducted into the Hall of Fame.